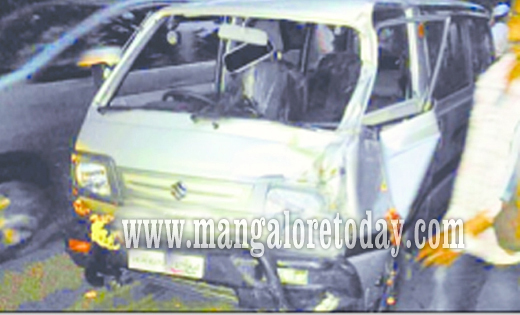 Puttur, Oct 24, 2016 : Two teenagers lost their lives when the two-wheeler which they were riding was hit by a Maruti Omni near Sunkadakatte in Aithur village on Kadaba-Subrahmanya Road on October 23, Sunday evening. The deceased are Shreyas, son of Ramanna Gowda of Bilinele and Lakshmisha, son of Duggappa Gowda of Kombaru. Both were 17 years of age. The two were on way to Kadaba when the Omni carrying pilgrims from Bengaluru knocked down the bike. The pilgrims were returning from Dharmasthala and were on way to Subrahmanya when the mishap took place. Both the deceased were students of a private tutorial at Kadaba. Sources said the two were scheduled to board a vehicle at Kadaba along with other 12 students of the tutorial to go to Chikkamagaluru to attend wedding of their senior in the tutorial. The vehicle was supposed to leave at 7 pm. Guys are crazy about bike and rides jolly ride forgetting everything. most of the time violating the traffic norms becomes cause to such incidents. Reckless driving. Driving is a skill. Don’t distract yourself while driving .